Be healthy through more health benefits of cloves. 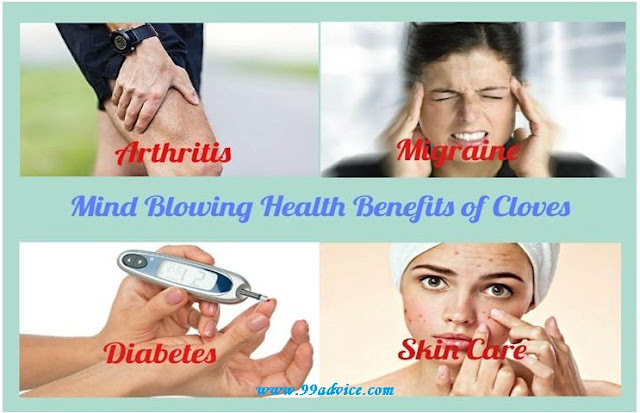 In my previous article, I have already mentioned some health benefits of Clove but this is not the ending point of health benefits of cloves. As we know that clove is a wonderful spice that has become a medicine for many diseases but there are more mind-blowing health benefits found in the cloves. Many people think that cloves should eat only those people who have a bad smell in their mouth, but it is not so true. Dental disease, respiratory problems, stomach worms, or any other illness which is related to the body, is removed by the use of cloves. By grinding cloves, or by mixing it in whole foods, it becomes aromatic. Cloves are used not only in the food but its oil is also used in toothpaste, soap, perfume, and medicine. When there is a pain in the neck or swelling in the throat, massaging of the cloves with mustard oil, gives relief from the pain. So friends, don't forget to eat two to three cloves every day as it is very good for health. 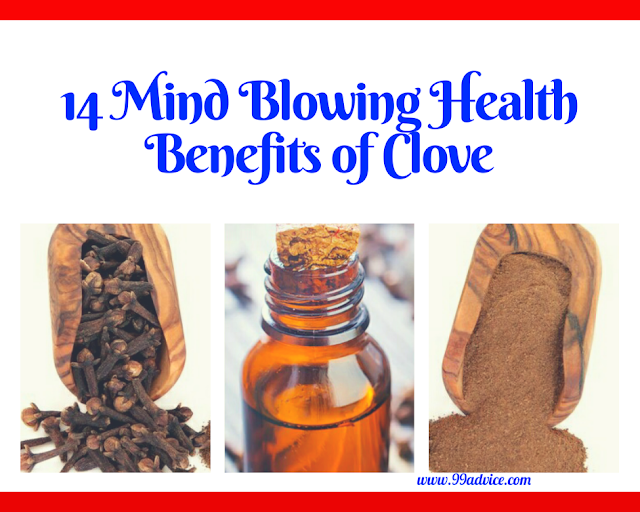 Now without wasting any type of time, I am telling you about the more Mind-Blowing Health Benefits of Cloves. ★ If you are a patient of arthritis, then you can eat cloves and make a paste of cloves and massage it into your joints. This medicine is very ancient, which has been running for centuries. When you apply this paste on your joints pains, as soon as the pain will disappear. ★ To get relief from arthritis pains, swollen muscles, and rheumatism pain, mix same drops of cloves oil with any other oil such as olive oil and massage it on the affected area several times daily during the day. ★ Another option is also to roast some clove buds and wrap them in a soft cloth and then place this pouch on the affected area. Keep it as long as it is hot and your pain does not get reduced. ★ With an intake of cloves, our intestines work properly and the process of making insulin in the body is intensified. The level of blood sugar is also controlled by the juice and enzyme of cloves. It also purifies the blood. ★ Grind roughly 5 grams of cloves with water and heat it slightly and after applying it on the back side of the ear, it gives relief in Migraine pain. ★ 10 grams of cloves and 10 grams of tobacco leaves grind with water and apply it on the forehead as a paste, removes the disease of migraines. ★ Use of clove oil is also very beneficial for the skin. It is also used in the treatment of acne. ★Apply clove oil with coconut oil in the ratio of 1:10 with the help of cotton daily two times on the affected area of the face until you get the desired result. ★ Conditioner for hair can also be made from clove. If your hair gets knotty quickly, the conditioner made from cloves is very effective. ★ Mix two teaspoon ground cloves and half cup olive oil and heat it on a low flame, but do not boil the mixture. Remove this mixture from flame and cool it. Now filter it and keep it in a tight container. Whenever you use the shampoo, take a small part of this mixture between your palms and apply it on your head skin. Allow it to last for 20 minutes and then shampoo. ★ From keeping cloves in the mouth, it will remove the bad smell of mouth and breath. Drinking cloves water in Typhoid is beneficial. ★ Take 5 cloves and 2 ltr. of water. Boil it and when it remains half of it then filter the water. Give this water repeatedly to the patient regularly. ★ Grind 10 grams cloves, 10 grams black pepper, 10 grams oregano (ajavaayan), 50 grams Lahori salt & 50 grams sugar candy, and filter it then mix in lemon juice. When it becomes dry take 5 grams of hot water, after taking food. 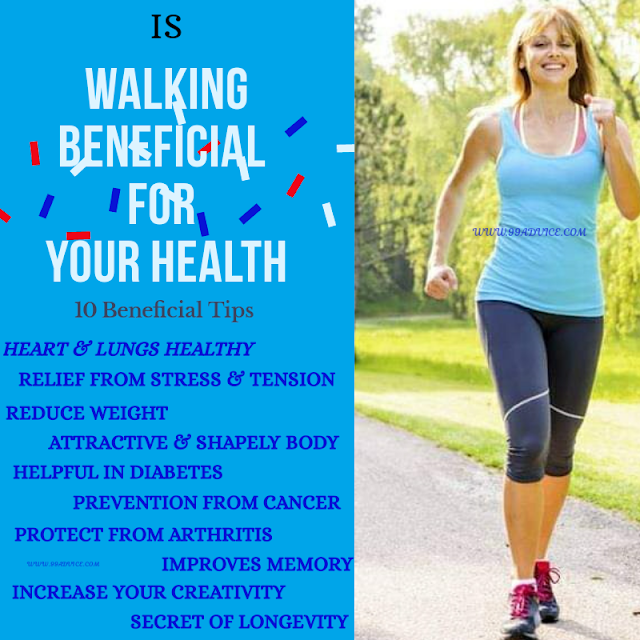 It is beneficial. ★ Mix 1betel leaf, 2 cloves, half teaspoon liquorice (Mulethi), 4 grains of peppermint into a glass of water and make the decoction of it and drink it. ★ Take 2 cloves & boil with water and cool it. Then mix sugar candy in it and give it to the patient. After some time vomiting will stop. ★ When you have the feeling of nausea, then chew the clove for relief. ★ After drinking a decoction of cinnamon & clove, vomiting will stop. ★ Taking clove and parsley powder with honey or lick the powder of roasted cloves with honey is remove the problems of vomiting. ★ Grinding and mixing 2 cloves in half cup of hot water and drink it.This will give relief to vomiting problem. Clove is very beneficial in relieving inflammation in the nose. If cloves are included in the diet for a long time, then it can give rid of the sinus to a great extent. You can also take advantage of it by smelling the whole clove. ★ There is no infection by drinking three teaspoons of clove oil daily in hot water and taking breathing also becomes easier. ★ To get relief from a stomach pain, take 120mg to 240mg of clove powder in the morning and evening and get relief from a stomach pain. ★ 1 clove is chewing twice a day (morning and evening) after eating the food, it gives relief from acidity and diseases caused by it. 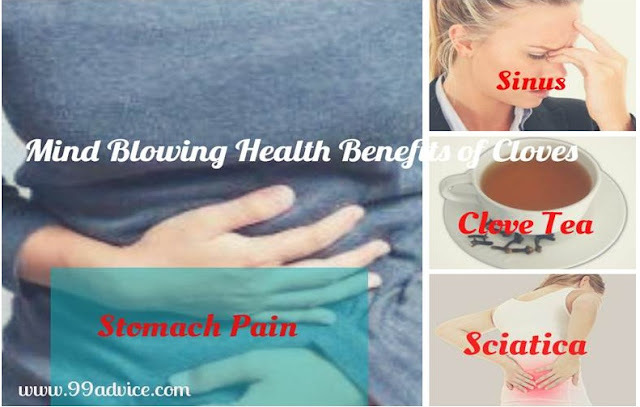 The stomach remains strong by the use of cloves and it is beneficial in the diseases of stomach worms, mucus, respiratory illness, and cough etc. ★ Take 1 to 3 drop of clove oil mixed with sugar candy or mixed with eatable gum, it provides relief in a stomach pain. ★ Grind 10 cloves, 2 pinches black salt, half a pinch of asafoetida, and drink it with lukewarm water twice a day. ★ Massaging the clove oil on the foot ends the pain of sciatica. Due to its pleasurable fragrance, clove can help in making our body stress-free. Stress often creates tension in the muscles of the body. Eugenol is a component which is present in cloves, very useful for relaxing the muscles. ★ To keep your body tension free, mix some drops of cloves oil in water and then take bath. ★ To remove stress, drink tea made from cloves. ★ To remove the stress of body and mind, drink tea made from cloves. You can prepare flavored cloves tea by adding basil leaves, mint leaves, and cardamom. If you want, take this mixture with honey and get relief from stress. So, friends, you can treat your general diseases with the help of cloves at home. But where cloves are beneficial on the one side, on the other side, if you are not using the right quantity of cloves it is very harmful, as its tendency is very hot. Hence it is said that “excess use of anything is bad” so take care while using the cloves in treatment. Be healthy, be happy. Thanks for reading. Hello Sandeep, Thankx a ton for appreciating our blog. We hope that you are always liking & reading our post... kindly share the useful tips with your loved ones.